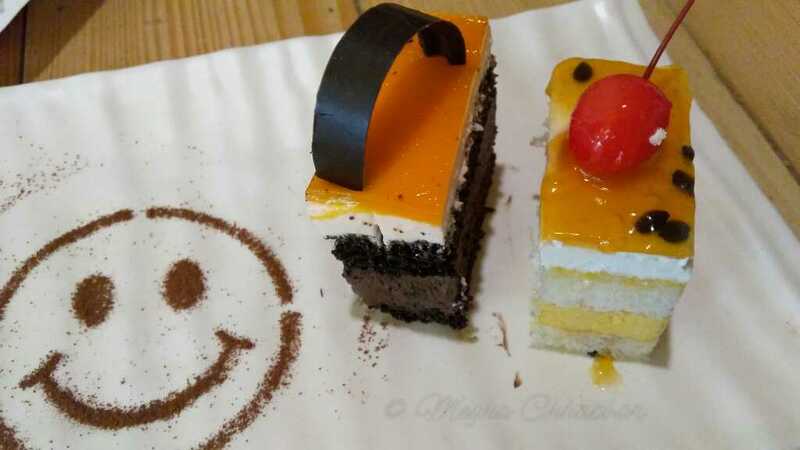 Fit Foodie Megha: Forennte – made with love — Reviewed! International women's day was a memorable one this year. A day filled with surprises and one among them was a goodie bag from Zomato. Thank you Zomato for this appreciation. 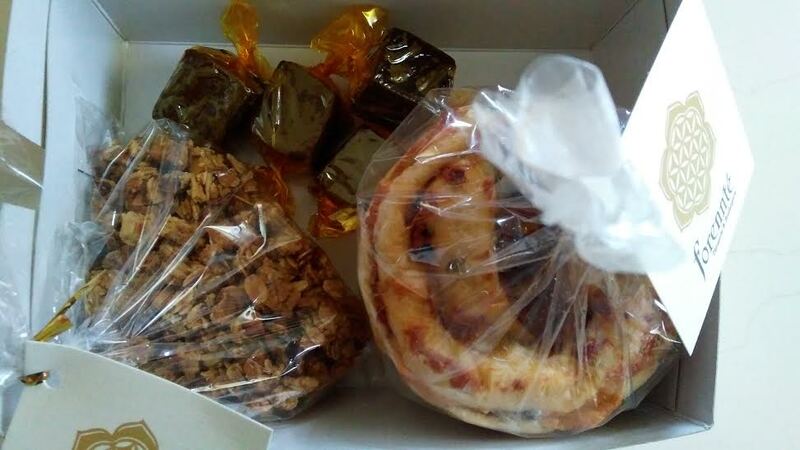 The best part of the goodies was from Forennte which had a Marble cake slice, Jalapeno Pinwheel and the chocolates- Roasted Almonds Rock and American Gooey Fudge. This is the first time I tried anything and now nothing can stop me! :) Jalapeno Pinwheel was super delicious, soft masala bread with red jalapeno pepper stuffed in the center. One could feel the freshness, aroma of spices. Oh, the taste still lingers in my mouth! Marble Cake Slice was a little piece of joy with right amount of balanced sweetness. Loved it! My wish was granted and was called by Namrataa for tasting of newly introduced pastries. She is cute, fun-loving woman entrepreneur who has a passion for cooking and especially baking. This was the first time I visited Forennte and glad I did. Little, nice, cosy, quaint, artistically designed cafe with seating capacity for almost ten to fifteen people. Mezzanine floor is kept for any art related workshop—painting, baking etc. Namrataa has already exhibited few art-works of local artists and planning to do more. When asked about Forennte, she said, "It was born out of my love for the arts and passion for baking. I always combine grandma style recipes with high quality ingredients to create and exotic experiences of enticing flavours." Well coming on the food, she wanted me to play a guessing game of differentiating eggless and egg pastries. 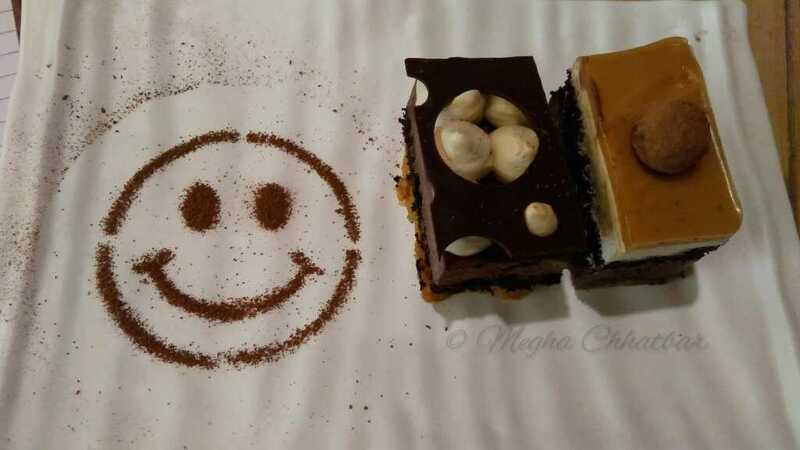 We were served cute looking two pastries with a chocolate powder smiley! Yes..It can makes someone's day! Such a positive vibe you get. First two were, Chocolate Orange Gateau and Tropical Sunshine. Chocolate Orange Gateau was a delicate chocolate sponge layered with cream and covered in orange mousse. It looked so beautiful. First bite and tangarine flavour outburst in mouth followed with chocolate. Tropical Sunshine, another gem with passionfruit twist. Salted caramel, a dreamy cake, filled with creamy not-so-sweet caramel icing with sea salt for balancing. Next plate had Giotto Gateau which was a combination of chocolate mousse and tiramisu with a crunchy base. It was gooey and creamy. One of my favourite! Sacher Torte had nice rich dark chocolate and raspberry flavour, totally loved it. Overall, it was fun meeting Namrataa and yes its the place, I would visit again for sure! Do enjoy few more photographs. This seems like such a nice, cozy place. I love the artistic touch that has been given. The desert looks great too. All the best to Forennte!